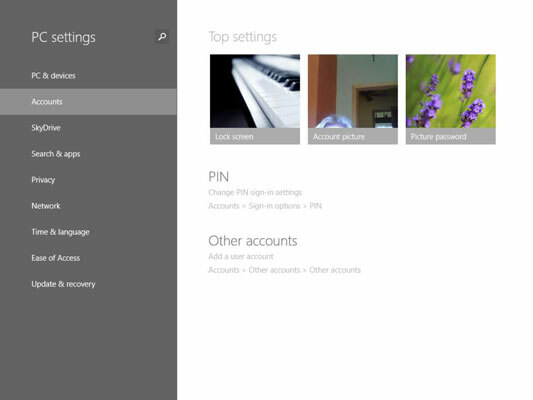 One of the first things you’ll need to do on your new laptop is create a Windows 8.1 User Account. You can set up several user accounts for your computer, which helps you save and access specific user settings and provides privacy for each user’s files with passwords. 1Press Win+I to display the Settings panel. You must have administrator status to create new users. This will give you the PC Settings screen. 3In the PC Settings screen, click Accounts. On the Accounts page, click Other Accounts. 4Click the Add a User button. 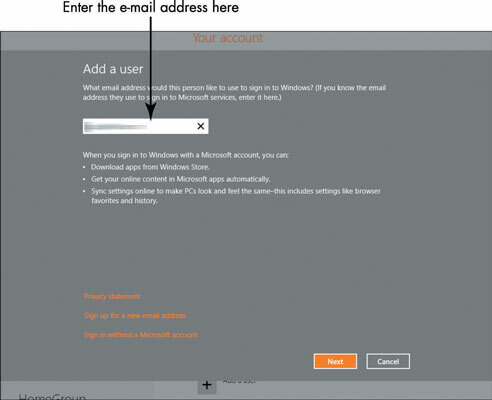 In the next screen, enter the user's Microsoft e-mail address (such as a Microsoft Hotmail account ending in @msn.com, @live.com, @hotmail.com, and accounts in the most recent version of Microsoft mail, Outlook.com). By providing this account information, you make it easy to sync settings, files, and apps (programs such as the Weather or Calendar app) among different devices. If the person doesn’t have such an account, click the Sign Up For A New Email Address link under the Email address field and follow instructions to create an account. 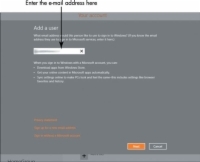 If the person doesn’t want an account, click the Sign in Without a Microsoft Account link at the bottom of the page and then click the Local Account button on the screen that appears and fill in the user information. 5After you’ve entered account information, click Next. This will take you to the next screen. After you create an account, when a user with administrative privileges is logged in, she can make changes to the user account in the Accounts panel of PC Settings, such as assigning a password. If you prefer, you can log in with a four-digit PIN in place of a traditional password. This makes it quicker to sign in. In the Accounts section of PC Settings, click Sign-in Options in the left panel, and then, under PIN, click the Change button, enter the current password, enter a four-digit PIN and verify it, and then click OK.